The Orionid Meteor Shower Peaks Tonight. Here's How to See It. Unless there’s a rare solar eclipse threatening to captivate the entire nation, it’s admittedly hard to keep up with -- let alone witness -- all of the spectacular celestial phenomena that unfold in the sky. 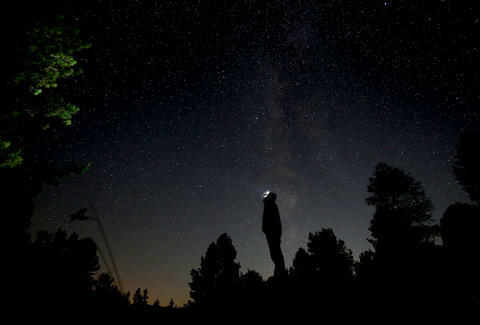 Luckily, we’ve got some good news if you’ve missed out on recent meteor showers or chances to see the Northern Lights so far this year: a major meteor shower will light up the sky on Friday night. The Orionid meteor shower is expected to peak this weekend, and the best chance to see the icy comet fragments burn up and streak across the sky is just before dawn -- around 3am local time. The annual display is active from October 2 through November 7, but you can expect to see as many as 20 meteors per hour during its peak. That is, if you manage to drag yourself out of bed at an unspeakably early hour and wander into a dark field for a good view of the spectacle. If you wake up on time (set at least three alarms), all you have to do is look for the constellation Orion with its belt of three starts in the eastern sky. You'll see the meteors throughout the sky, but they'll appear to originate from the area of the sky above Orion's Belt near the red supergiant star Betelgeuse. But don't rub your tired eyes or blink too much while you gaze skyward, as the Orionids have the fastest meteors of any shower. "The Orionids, because they're moving so fast, they burn up very quickly," Bill Cooke, who leads NASA’s Meteoroid Environment Office, recently told Thrillist. "In other words, you blink, you're going to miss them." On the bright side, viewing conditions for the Orionids will likely be excellent, largely thanks to a mere crescent moon that will set before midnight and provide a clear view of the meteors. Perhaps your biggest obstacle will be getting away from the light pollution of city lights (this map will help you find the darkest sky near you). Once you’ve found a good spot, give your eyes some time to adjust to the darkness while you wait for the shower’s peak to begin. Don’t bother with binoculars or telescopes, though, as you’ll want to see as much of the sky as possible to catch the meteors streak by from different directions. The Orionids' 20 meteors per hour won't be as exciting as the 120 meteors per hour you'll see during the peak of the the Geminid meteor shower in December, but the display is still remarkably special. In fact, the Orionids are actually bits and particles from Halley's Comet, which is pretty cool because the comet itself won't swing by Earth until 2061. If that's not reason enough to stargaze over a cup of coffee in the middle of the night, we don't know what is. Now would be a good time to set those alarms. Otherwise, you may end up having to settle for watching a livestream of the shower. Tony Merevick is Senior News Editor at Thrillist and wishes he could be somewhere remote enough to watch. Send news tips to news@thrillist.com and follow him on Twitter @tonymerevick.